We think this park is an amazing Wisconsin destination and believe you will too! 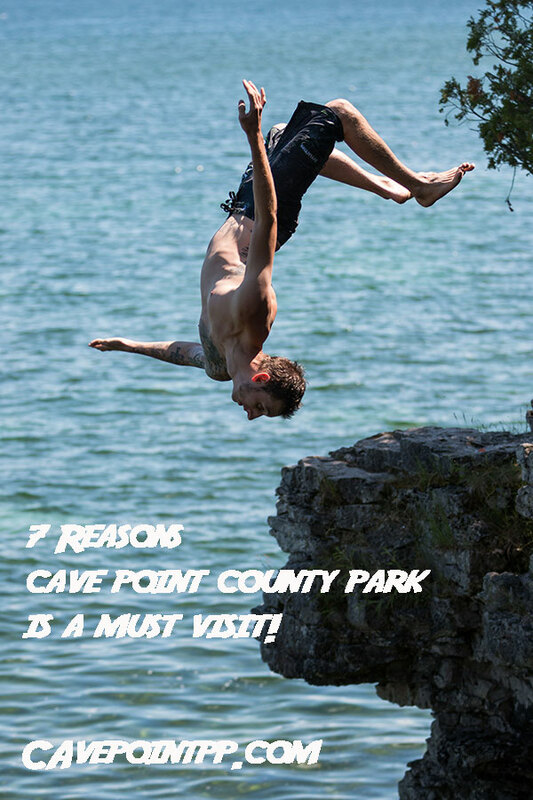 In 1943, the Door County Board of Supervisors preserved 19 acres as the 5th established county park and named it Cave Point County Park. The park is one of the best spots to visit when you are vacationing in Door County, Wisconsin! Not only is a free county park ( It is geologically gorgeous and photographers can’t get enough of it. No wonder it makes trip advisors top 10 list every year for things to do in Door County. There are a lot of activities to do in and around the park on land and on water. While it isn’t a state park, it is still a gem! Hint: If the parking lot is full, rent a bike and cruise in with style. Better yet, see Cave Point via kayak as most of the coves and caves are not visible from shore. The limestone cliffs, coves, caves amidst the backdrop of turquoise waters, and beautiful Lake Michigan views makes this park our favorite. Be mindful, each year this park claims lives. So stay safe, be cautious, lookout for one another out there and when in doubt, DON’T GO OUT! See below for some activities to do when you visit. See above safety precautions. The limestone rock is extremely fragile, but the waves have eroded a lot of the loose rock and made it slightly safer. If you fall off while climbing at here, hopefully it isn’t from a rock breaking free, you are going for a swim, while mostly positive, make sure you know what you are falling on under the water and fall flat. <meta itemprop=”articleBody” content=”SAFETY FIRST- Each year, cave point county park claims a life or more. Make sure you stay back from the edge when it is rough out or icey out. I can predict your outcome if you slip during the winter and end up in the water, YOU WON’T GET OUT! Use the buddy system when in doubt, or don’t go out! In summer, the waves splash on the rocks and create amazing photos, here too, it can be really hazardous to your health if you end up in the water during a major wave or ice day. You better have been practicing your rough water swimming or turn into a freshwater penguin. To see if the waves are crashing up on the rocks if you don’t want to risk a long drive, check the weather to find out if the waves are going off! South wind over 25 knots for 1-2 days will do it. SAFETY FIRST- Each year, cave point county park claims a life or more. Make sure you stay back from the edge when it is rough out or icey out. I can predict your outcome if you slip during the winter and end up in the water, YOU WON’T GET OUT! Use the buddy system when in doubt, or don’t go out! Photography recommendations- Use polarizers, choose the right time of day to take the photo, and or use a drone with a pilot license. This hiking trail leads all the way into Whitefish Bay Dunes State Park, so you can make it nice size hike if you would like to. Just be mindful of the roots, slippery rocks, cliffs and there is plenty of poison ivy off the trail. Pack it in, pack it out! Leave No Trace. Check out our Door County Hiking & Photography Tour to get a few amazing shots of Cave Point. There is a super cute gazebo here that I have seen plenty of weddings hosted at. Make sure you keep your event small, and it might be hard to get photos without someone in the background, as this is a very busy park. Sadly to say, there is no camping at the park and a local campground that was proposed around the corner was shut down by local neighbors with lawsuits, so if you are looking for camping, we recommend one near Baileys Harbor or over in Egg Harbor. Make sure to check out Whitefish Bay Dunes State Park. It’s right around the corner and one of the 5 state park gems of Door County. 7 Reasons Why Potawatomi State Park is the best park in Door County, WI.